A consecutive number printed on each bingo book that is used to quickly track sales and inventory. Contains information about each bingo booklet including serial number, audit number, paper type, series, pages per book, and page number. 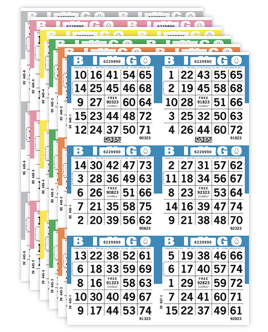 A group of specific numbered bingo sheets of different colors that are collated together, all containing the same number of faces to be played for each game at a bingo session. They are collated in the order in which they will be played. A tablet or pad of bingo sheets arranged in a specific color sequence. Available in either a standard or customized rotation. The color used on the bingo face that identifies which game is being played. Color can refer to a border, a tint or a solid colored sheet. Indicates the overall appearance of the sheet of faces. A cut may be square, horizontal or vertical. An individual bingo card containing 24 numbers plus the free space number. A number located in the free space square that identifies the unique bingo face and enables a winning face to be verified electronically or manually. A combination of squares which must be completed in order to win a bingo game. Bingo paper that is sold individually that is not collated into books or pads. Also referred to as Specials or Straight Goods. The number of bingo faces per sheet. For example, a 3 ON has 3 faces per sheet. 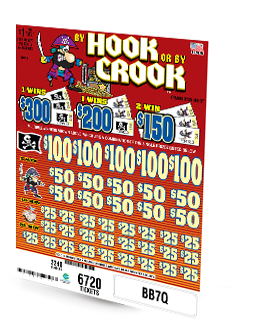 Refers to bingo paper that is bundled into booklets in order to provide more control than loose paper. Sold as a full series in one color, and usually in pads of 25. 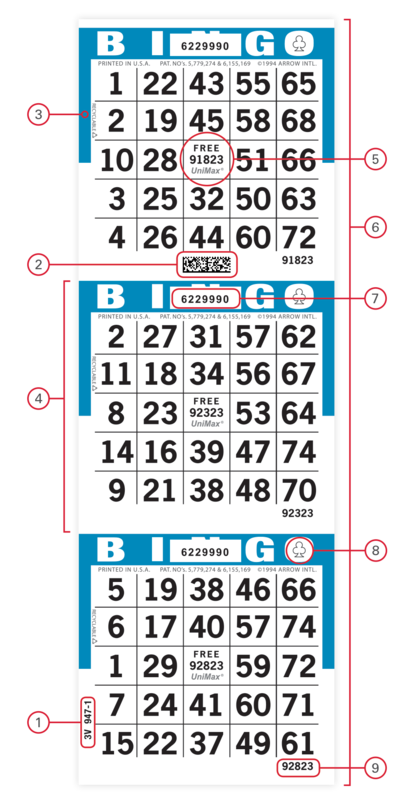 A number printed on the "N" of "BINGO" on each bingo face to identify a particular printed set and is primarily used to keep unauthorized paper out of the game. Identifies the cards in play by the different range of 9,000 cards. Example: 1 - 9,000; 9,001 - 18,000; 18,001 - 27,000 … 99,001 - 99,036. A unique symbol located on every bingo face (in certain series) in the "O" of "BINGO" that is used to easily identify each series. 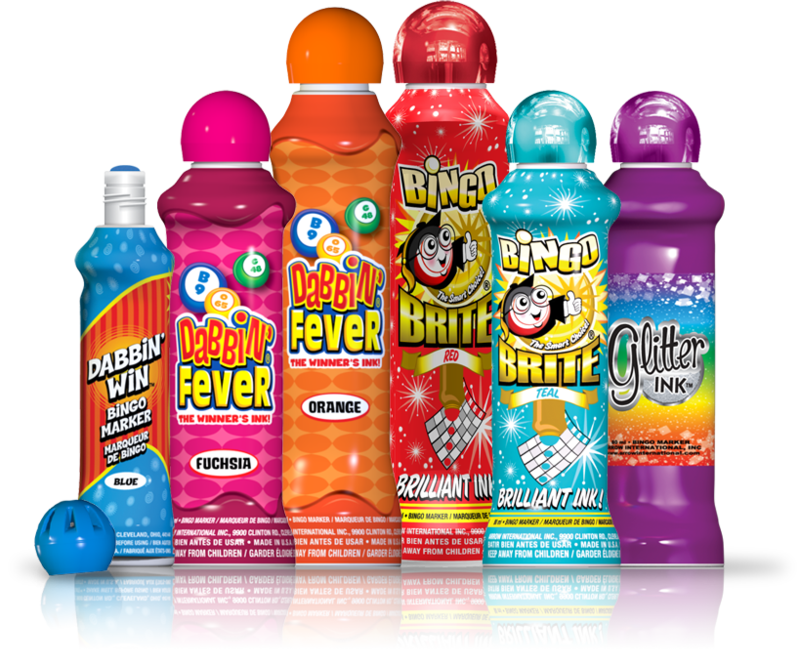 An entire evening or daytime bingo program, consisting of a series of regular and/or special bingo games. A specific grouping of bingo cards that constitutes a single selling unit. A game played with paper that differs from the main pack purchased at admission. The number of sheets in a booklet. 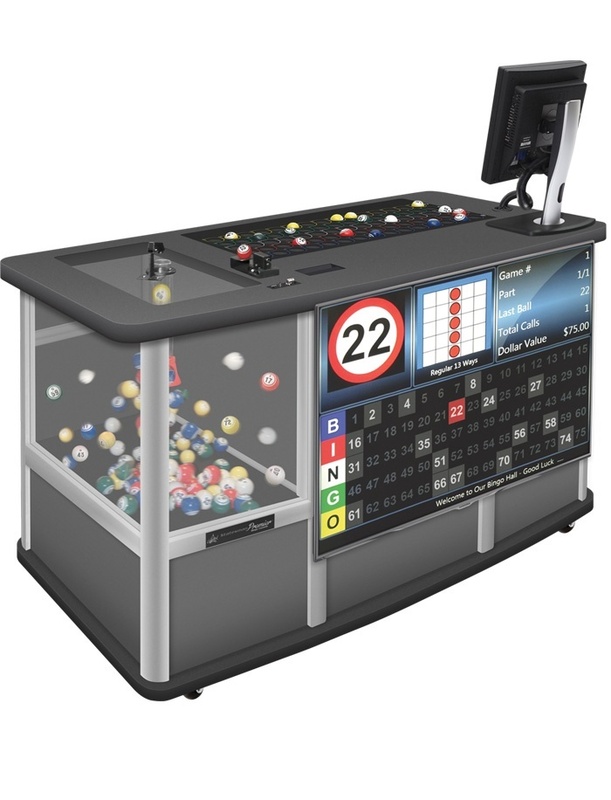 The unique number located on each bingo face that identifies a unique 24-number configuration. It is the same number as the Free Space Number and is also referred to as the Secondary Free Space Number.